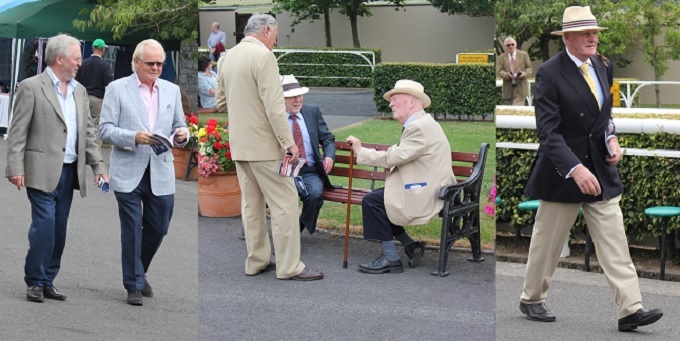 Our trip to the Curragh was a rather last minute affair. Mainly due to the fact that I had got into my head that it was this weekend. It wasn't until Thursday evening when I voiced my plans to Scott that he questioned why I was not going to Scotland as my flight had already been booked!! ooops! 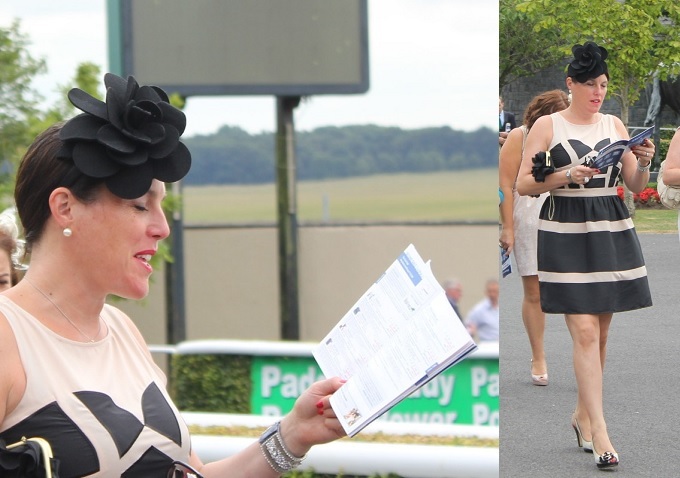 My first dilemma was what to wear....... Luckily I had ordered a new Red dress from ASOS ready for Glorious Goodwood. Suitcase packed Saturday afternoon we headed for The Curragh. I have never visited Ireland before so I was extremely excited to experience the delights which it had to offer. We stayed at Martinstown House which is situated around a 5 minute drive from the Curragh Racecourse. Stumbling across this B&B on Trip Advisor we didn't really have any expectations, but what we experienced was truly incredible. The owners were very friendly and made sure everything we required was readily available. Although we arrived at around 9pm we were greeted with an incredible 5 course meal which was not unlike something which you would experience in a top London restaurant and was prepared from produce grown within the grounds or supplied by local farmers. Martinstown House is by no means a hotel it is a charming, romantic house with understated luxury creating a relaxed atmosphere and is the perfect location to unwind before a busy days racing. We were the first people to arrive on course; so I decided to have a wander around and get my bearings. The Curragh is a little like going back in time. The grandstand is very old fashioned yet well kept, it reminded me of the racecourse in old racing films. The presentation at the course was beautiful with colourful hanging baskets and wonderful floral displays everywhere you looked. It definitely gave you a peaceful feel. The only problem which we experienced was that no one seemed to know where the owners and trainers bar was, after several wild goose chases we decided to sit outside the lovely Tapas and Champagne bar. Which overlooked the parade ring making it a wonderful position for spotting not only the different fashion on display, but also gave the perfect view to hopefully pick the winning horse for each race. The Curragh also houses various stalls which were selling everything from Handbags and shoes to Berney Bros Saddlery selling a variety of high quality equestrian products & clothing. The shop which caught my eye was Mad Hatters which is situated beside the Parade Ring with a range of quality hats and accessories.I even purchased a little hat for Goodwood. I just hope it makes it here in time!! Overall the fashion on display was impressive. There was a lot of Gatsby inspired glamour and vast amounts of impressive millinery on show. There was a table of young ladies in the Champagne Restaurant who definitely stood out from the crowd. They were all dressed immaculately wearing beautiful headpieces, elegant dresses and perfect hair and make-up. 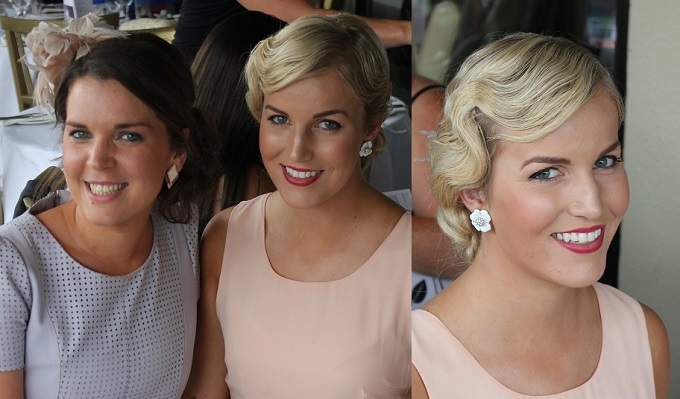 They were a really friendly group of girls and I hope they had a lovely day at the races. 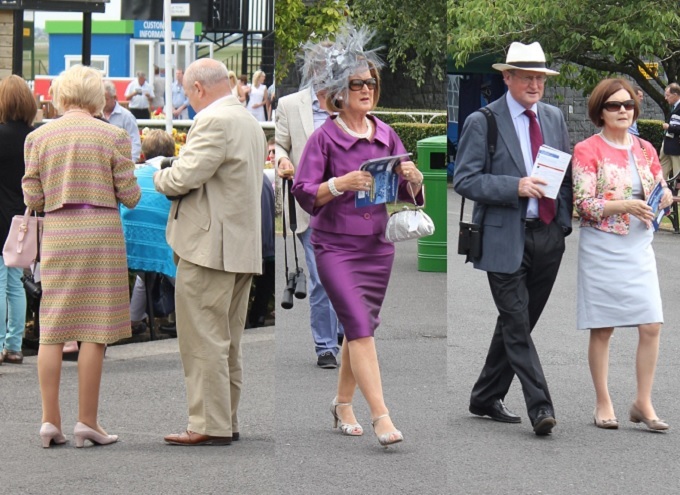 The more mature ladies also took centre stage in the Style stakes with some beautiful classic tailoring and brightly coloured jackets on display. A mention has to go to this Lady who wore a very unique floral headpiece which matched her outfit perfectly. The well fitted Linen suits, perfect colour combinations, panama hats and well shined shoes made up for the lack of ties on show. Ensuring the Gentlemen's fashion did not disappoint although there was still room for some improvement. 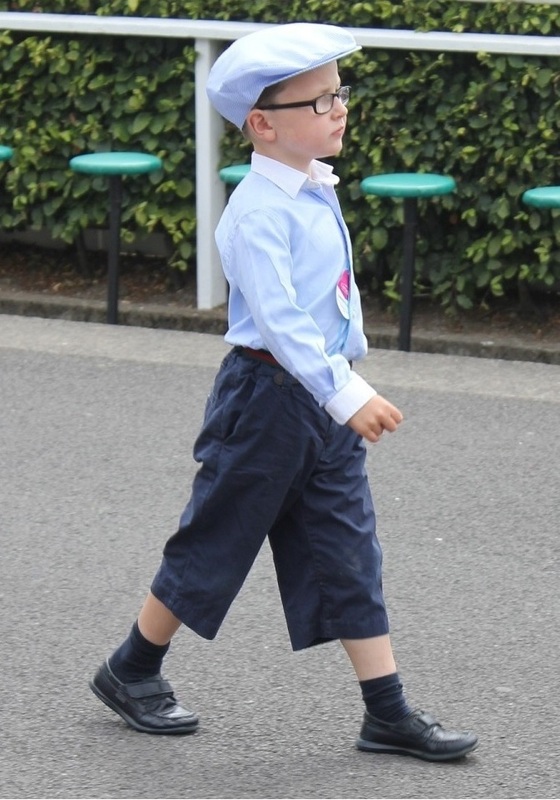 Best Dressed has to be awarded to the below little boy and his twin brother unfortunately I didn't manage to get a picture of them together but I thought they looked fantastic in matching outfits. In conclusion my first trip to Ireland was a brilliant experience and I hope it is not too long before my next visit, fingers crossed next time we go home with a winner. I would definitely recommend Martinstown House to anyone who is looking for accommodation near to The Curragh, I just hope that it is not fully booked next time we require a reservation.